Tags: Anthony Carleo, Bellagio, las vegas, robbery. Posted on Monday, March 18, 2019 by "T". 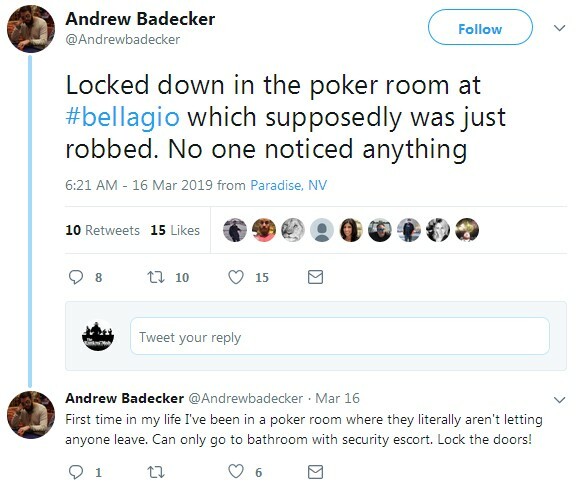 It has been 16 months since the Bellagio poker room was first robbed, and this second time it was robbed on March 15, Friday evening. Unlike the first robbery wherein the suspect remains at large, this time the suspect was apprehended. 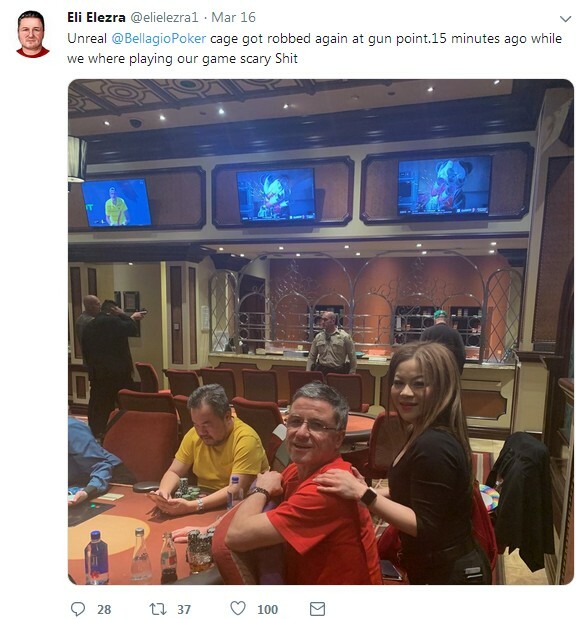 Police say that around 9:45pm on Friday, an unidentified man entered the Bellagio poker room holding a gun and demanded cash from the cashier cage. How much money or casino chips he got was unknown. Afterwards, the robber went out from the north casino entrance and attempted to steal a getaway car from a guest using the valet. That's the time when four police officers arrived and engaged with the robber. The suspect shot one of them, striking him in the chest. Fortunately for the officer, he was wearing a bulletproof vest. A second officer returned fire, successfully hitting the robber once but enough to cause fatal injuries. He was taken to the University Medical Center in critical condition. Thanks to the bulletproof vest, the officer who was shot is expected to survive after treatment from minor injuries. Following LVMPD policy, they will only reveal the names of the officers involved after 48 hours. The Bellagio poker room is typically always jam-packed on Friday evenings. Many well-known poker players can be found playing inside Bobby's Room, an exclusive high-stakes room. 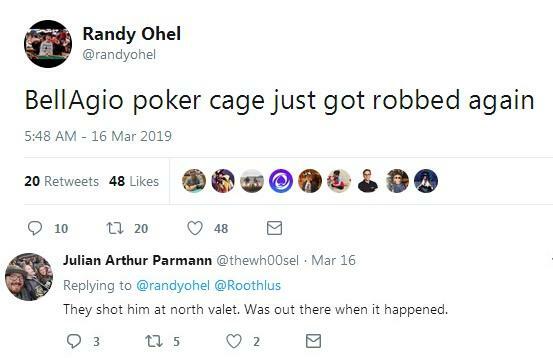 Poker players who were at the Bellagio shared their experiences via Twitter. Rick Fuller, a former police officer who has been playing poker for over a decade, took a picture after the incident. Eli Elezra, a reg in Bobby's Room, posted a photo showing him near the cage where it had been robbed a few minutes before. An update by a police spokesman Officer Aden Ocampo-Gomez revealed that the robbery suspect died while being treated in the hospital. Sixteen months ago around mid-afternoon, an armed man wearing a blonde wig and glasses stepped into the Bellagio poker room. He escaped and still remains at large to this day after robbing an undisclosed amount of casino chips and money. In 2010, Anthony Carleo robbed the Bellagio of $1.5 million in chips. He was caught and sentenced to 3 to 11 years behind bars. 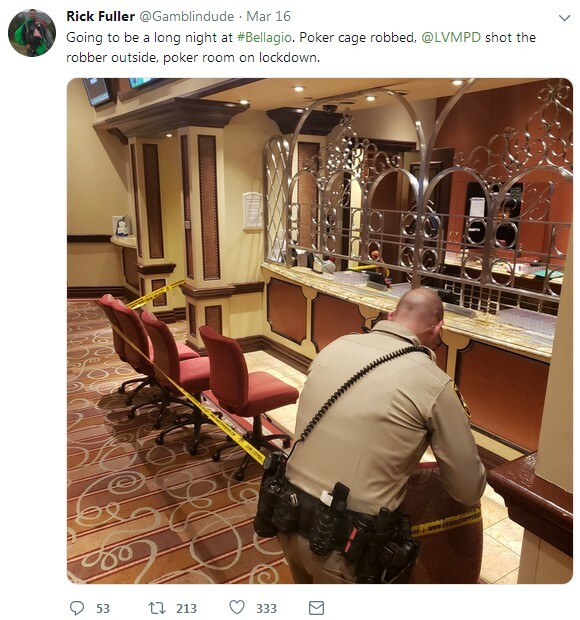 13 comments for "Bellagio Poker Room Robbed Again - Officer Injured, Suspect Dies after Shootout"
It's sad to see people who are trying to rob casinos or other places and to shoot with weapons in cops or in people. These attackers are crazy and it's not normal to kill people when you try to rob. If you rob something and you can not get out of the police, then you have to surrender. Unfortunately, some people try to shoot, not to surrender. well I think personally that in this situation nothing bad happen, policeman is safe and no injury to him because he wear bulletproof vest and to criminal it is bye bye from this world, I not have bad words about this, he not eat free food from taxpayers. The casinos will always be a target for the criminals. 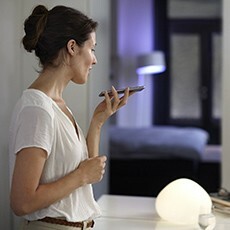 But it is not an easy target after all, with all the security measures they are having. And while we see the previous robber got away with it, this one lost his life. 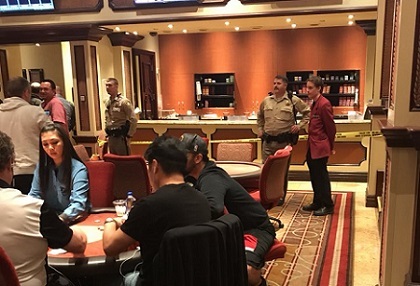 no matter what security you have at casino,somebody will always try to take money and to to leave!in this case he didnt want to go in jail and he died!its good that nobody didnt die from workers or policemans,beacuse they are just doing their job! There are some guilty people in this situation and they are the owners of casinos. When you make a lot of money with the casino, then you can afford to hire another 2-3 employees with weapons to guard that money and the chips. Unfortunately, they do not want to guard their own cash desk too well and the thieves take advantage of this goal left. This can be called a security breach. I really want to go to Las Vegas. It sounds like apart from all of the other exciting and wonderful things that are there to be experienced, there is every chance that you can be involved in or at least witness an armed robbery! When I say involved in, i don't mean take part in, but be subject too! (Just for clarity!) Cant wait to get there. It's nice to go there for visit, to enjoy in more games and of course to enjoy of travel and buildings. This thing with the robber it's not good because you may be hurt or you may be killed by some people without discernment. Some people are so desperate for money and he did not hesitate to kill for it. You can visit this place if you find a job where you are well paid. Many people say it's really hard to get in Las Vegas but there are more ways to visit that city. All you have to do is to save some money and your dream is realistic. You ask for loan money from your friends and good luck at the casinos.